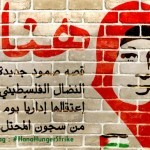 Addameer Prisoner Support and Human Rights Association has called for the immediate release of Hana Shalabi, a Palestinian prisoner on hunger strike, who is being held without charge or trial in an Israeli prison. Shalabi, 29, began her hunger strike when she was arrested on February 16 from her family home in Burqin village, near Jenin, during a raid involving 50 Israeli soldiers, an intelligence officer and a “large number of dogs”. No arrest warrant was shown. She is eating neither food nor minerals, and is currently only drinking water. Shalabi has vowed to continue her protest against her administrative detention, despite Sunday’s announcement by Israel’s Ofer military court that her six-month administrative detention will be reduced by two months. Islamic Jihad, issuing a statement on March 5, said that Shalabi’s hunger strike is a victory for all Palestinian detainees. Administrative detainees can by held by the Israeli military indefinitely on secret evidence without being charged or standing trial. Neither they, nor their lawyers, have access to the “secret evidence”, and legal defence is, effectively, impossible. Palestinians have been subjected to administrative detention since the time of the British Mandate. There are currently more than 300 prisoners held by Israel under this system, including two dozen elected members of the Palestinian Legislative Council. Shalabi, described by Haaretz as “a member of the Islamic Jihad militant group”, was released from a previous round of administrative detention in October 2011, after 25 months in prison without charge. During that time, she was allegedly physically abused and sexually harassed. Addameer lodged a complaint regarding violations of her rights, which included beatings and being photographed by Israeli soldiers in humiliating positions. The organization only received a reply from the district prosecution in Haifa two years later, stating that the file was being closed for “lack of evidence.” Her lawyers were never told by what process the complaint had been investigated. Shalabi was released as part of the first round of the prisoner exchange deal between the Israeli government and Hamas, in which a total of 1,027 Palestinian political prisoners were released in exchange for captured Israeli soldier Gilad Shalit. Shalabi’s father, aged 67, says she has not been active in the group since her release. He and her mother, 65, began their own hunger strike on February 23, the day that her current administrative detention order was issued. She was sentenced to seven days’ solitary confinement on the same day, as punishment for her hunger strike. Polls show that more Palestinians than ever are supporting non-violent resistance as a tactic, and the recent 66-day hunger strike of 33-year-old detainee Khader Adnan, who was never charged with any crime, has raised Palestinian spirits and popularised non-violence even more. Israel’s concession to his minimum demands has been described as “the submission of the fierce wolf to the helpless lamb”. However, Addameer has said that, “in complete contradiction to the District Court decision of 23 February”, he was shackled by his arms and legs during his transfer to the operating theatre for surgery on February 27. It is feared that the “pendulum of public opinion may soon swing back to armed resistance” if non-violence does not achieve its promised aims. Addameer says that international humanitarian law “permits limited use of administrative detention only in emergency situations, but does not allow for its use as punishment when there is not sufficient evidence for criminal procedures”.